Learn about the UC San Diego diesel idling policy and prevent the release of polluting exhaust into the atmosphere. UC San Diego's diesel idling policy complies with the California Code of Regulations and the California Health and Safety Code. Diesel exhaust is deemed toxic by the Office of Environmental Health Hazard Assessment, and as such the regulations have been issued in an attempt to eliminate the unnecessary idling of diesel engines. 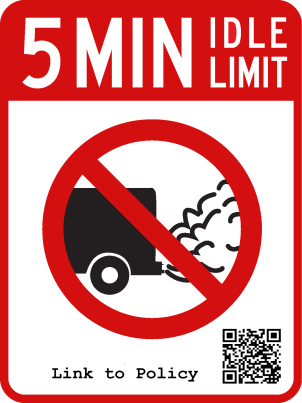 No vehicle may idle for more than 5 consecutive minutes on UC San Diego controlled property, or when in use by UC San Diego personnel or its agents. In a case of exceeding the limitations, a fine may be issued to the owner, renter, or lessee of said vehicle. Applicable vehicles can request an idle limit sticker by contacting UC San Diego Environment, Health, and Safety. The written version of this policy is required by the California Air Resources Board. Learn more about the UC San Diego diesel idling policy (PDF) and the possible limited exemptions. Contact Environment, Health and Safety to report a violation: ehsea@ucsd.edu or 858-534-3660.